A boy carries one of the bamboo poles, which were unloaded near the settlement for use in building basic shelters, in Cox's Bazar, Bangladesh, on 8 July 2018. The refugee crisis in Bangladesh sparked by the mass exodus of people from Myanmar almost a year ago risks creating a “lost generation” of Rohingya children who lack the life skills they will need in future, the United Nations Children’s Fund (UNICEF) has warned. Inside Cox’s Bazar, some 1,200 education centres were operational by July this year for around 140,000 children – a significant achievement, given the level of demand. But there is no agreed curriculum and few learning opportunities for all those above 14 years old, problems that UNICEF is intent on resolving, by providing a higher quality education that focuses on literacy, language and numeracy, as well as “essential life-skills”. “It’s about an insurance against a loss of a generation of children to hopelessness and despair -something that we really must avoid at all costs,” Mr. Ingram said. According to the UN agency report, girls and teenagers are especially at risk of being excluded when it comes to educational opportunities in Cox’s Bazar. It also calls on the Government of Myanmar to ensure that in Rakhine state – where more than half a million Rohingya remain ­ children from all communities have equal access to quality education. 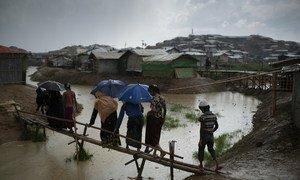 But verifying this is challenging, given that UNICEF’s access to the state is only partial, according to Mr. Ingram, who noted that Rohingya displaced by intercommunal violence in 2012 continue to live without hope in camps located in central Rakhine. Under an official deal signed by the UN and the Governments of Myanmar and Bangladesh in June, it was agreed that efforts would be made to create appropriate conditions for the voluntary, safe and dignified return of Rohingya refugees to their former communities. To date, no such returns have happened, Mr. Ingram told journalists at a press briefing in Geneva.